Cars are stored in Carvana's "vending machine" off of I-79 in Bridgeville. But now, the company is also trying to make the process a little more fun. Southwestern Pennsylvania is the latest of 16 markets to get one of Carvana's car "vending machines." The facility just off I-79 in Bridgeville, about half an hour south of Pittsburgh, isn't exactly a vending machine; it’s more of a tall building used to store cars. It’s equipped with a lift that can grab each car off a platform and lower it down to a car bay, where the new owner can jump in and drive it home. Ryan Keeton, co-founder of Carvana, at the company's newest car vending machine located in Bridgeville. 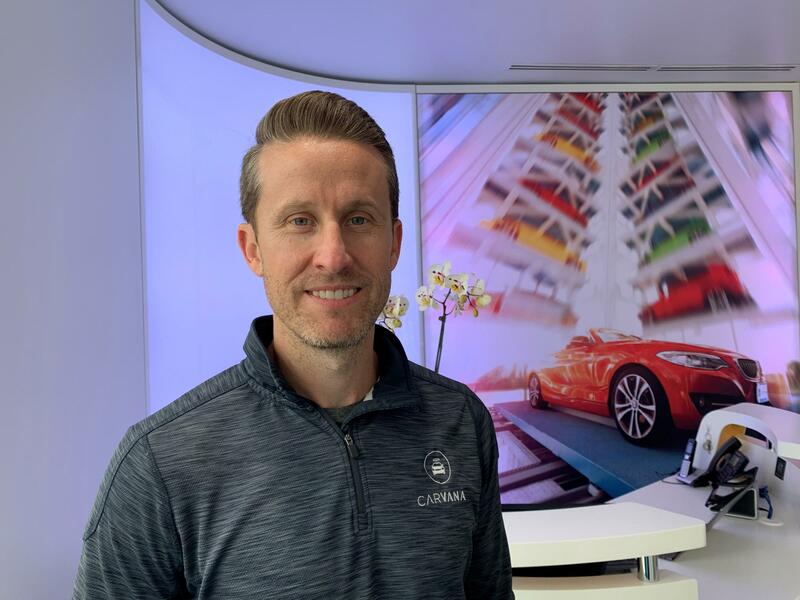 “It's a beautiful glass structure that's very well lit, that it almost looks like there's little treats inside, but the treats are actually, you know, real cars,” says Carvana co-founder Ryan Keeton. The cars in the car vending machine are ones that have already been purchased on Carvana’s website. Instead of waiting for the car to be delivered to their home, a buyer can elect to pick it up at the vending machine. Once the new car owner checks in on the kiosk, they’re given an oversized coin to drop in a slot, kind of like an oversized arcade game. After that, the lift starts moving and finds the car. “It already knows your car is up on the eighth floor, it automatically goes up and grabs it, brings it all the way down and then you kind of see it kind of land and then it gets brought into one of our bays,” says Keeton. It’s a fun gimmick and a successful marketing tactic, said Automotive News reporter David Muller, but the vending machine itself won’t change the used car industry itself. But, he said, the company's online-only approach to selling cars and flexible return policy is already making an impact on the industry. A small group of protesters gathered outside the Three Mile Island nuclear power plant in Dauphin County -- on the 40th anniversary of the partial meltdown of the facility's Unit 2 reactor.